One makes plans and the universe just laughs. There is a lesson to be learned here. Our day definitely did not go as planned or, more accurately, as we had hoped. Time to make lemons into lemonade and turn an ordeal into an adventure. Our hope was that a rest and relaxation day in Porto would magically heal the nagging tendinitis in my left heel but at the end of the day I had tendinitis in both heels. 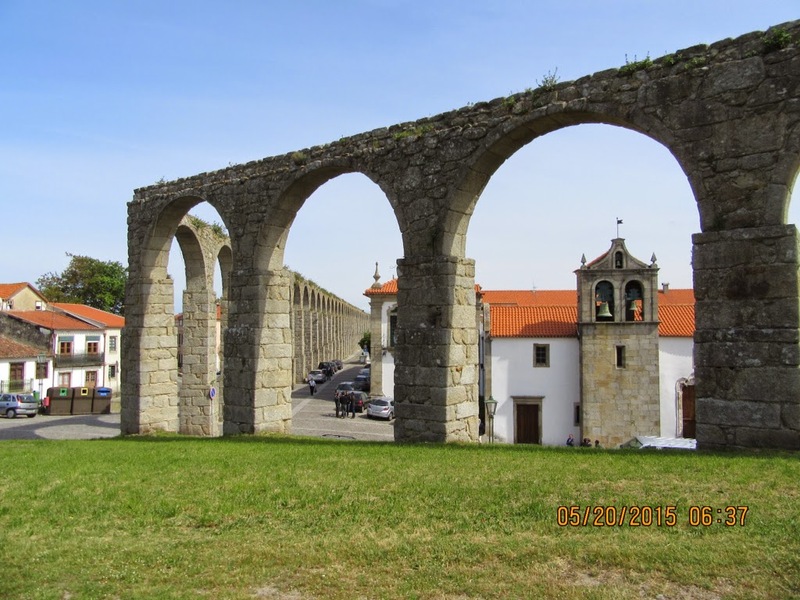 This morning we got ready early planning to take the Metro to the coastal village Matosinhos where we intended to start walking the boardwalks along the coast line 23kms to Vila do Conde. 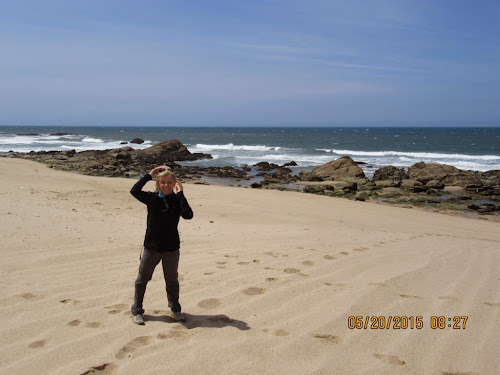 This was a walk we were both so looking forward to; a beautiful trek along the Atlantic coastline. Unfortunately the walk from our room to the elevator put a quick end to that idea. New plans had to be made. 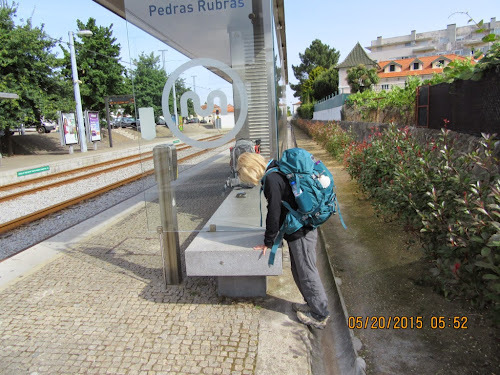 Plan B (as in 'bummed out') was to take the Metro straight to Vila do Conde and rest my tendinitis. We did walk out from the centre of town to the ocean where the wind from the North was strong enough to knock me off my tender feet and the sand was blasting into our faces. That beautiful trek along the Atlantic coastline might have been a little bit tougher than we had envisioned. Maybe we dodged a bullet on this one. 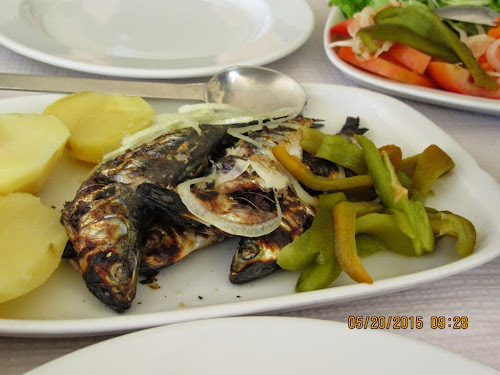 We looked for the ship museum but got distracted by a restaurant where they were grilling fish on an outdoor barbeque. It seems like a good plan to relax and have lunch; grilled sardines and batatas o murrah or something like that. 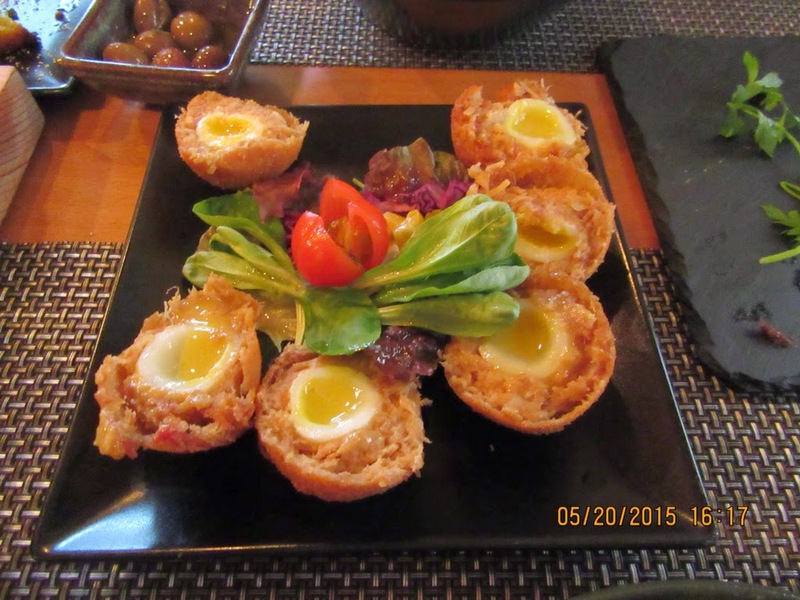 We found another culinary gem this evening, the tapas bar, São Roque. Tapas bar does not seem an elegant enough description for this dining experience. Dayton had some really unique tapas, one of which was battered and deep fried sausage meatballs cut in half and resting in the middle of these little nests of sausage were perfectly cooked bird's eggs. Vegetarian tapas are an oddity but they did offer me a variety of sweet breads (actually bread not the meat variety) which were deep fried. I see a low carb diet in my future. Stretching calves to alleviate heel pain? Hi Karen and Dayton, sorry again to hear about your struggles, but hoping for better days ahead for both of you. On the brighter side lunch looks great! Peace be with you. Hoping your feet get better soon! And dear LORD that food looks good! !